How do you calculate the cost-minimizing combination of resources? The ratios must equal one another. If you need the MP / P to decrease, then hire more units of that resource. This is because of diminishing marginal returns (as inputs hired increases, marginal product decreases). If you need the MP / P to increase, then hire fewer units of that resource. How do you graph a perfectly competitive resource market and firm? When graphing perfectly competitive resource markets (such as labor), it is a good idea to graph the market for the resource and the firm hiring the resource side-by-side. The resource market sets the the equilibrium price of the resource (or wage for labor) and the firm takes the price of the resource ("wage taker") from the market. The resource market consists of a downward sloping demand curve (AKA marginal revenue product) and an upward sloping supply curve. The households supply the resources and businesses demand the resources. The firm is a "wage taker" so the supply curve is perfectly elastic. This represents the firm's marginal factor cost (AKA marginal resource cost). The firm's demand curve is a downward sloping marginal revenue product curve. The No Bull Review graph below illustrates a perfectly competitive firm hiring its labor from a perfectly competitive labor market. How can the government correct a negative externality? Negative externalities exist when the marginal social costs (MSC) exceed the marginal social benefits (MSB). Society is getting too much of the good at too low of a price. The government can correct a negative externality by imposing per-unit taxes on producers to raise the costs of production. This way the MSC=MSB. Another policy option is to tax buyers so that the MSC=MSB. In the end, the correction will eliminate deadweight loss from the market. How can the government correct a positive externality? Positive externalities exist when the marginal social benefits (MSB) exceed the marginal social costs (MSC). Society is getting too little of the good at too low of a price. The government can correct a positive externality by offering buyers per-unit subsidies (or incentives) to increase demand so that the MSB=MSC. Another policy option is to offer sellers per-unit subsidies to encourage more production so the MSB=MSC. These policy actions will get rid of the deadweight loss in the market. How do you graph a negative externality? A negative externality occurs when the marginal social cost (MSC) is greater than the marginal social benefit (MSB). Society is worse off from the production of the good. There is a misallocation of economic resources and deadweight loss. Markets overproduce goods that generate negative externalities. The No Bull Review graph below illustrates a good that creates negative externalities (MSC>MSB). The area of deadweight loss (inefficiency) is the purple triangle. P1 and Q1 is socially optimal, however the market generates a price of P and quantity of Q. Society is getting too much of the good at too low of a price. How does a lump-sum tax affect a firm's level of output? A lump-sum tax has NO EFFECT on a firm's level of output because a lump-sum tax does not change marginal costs. It increases the firm's fixed costs and therefore shifts the average total cost upward. This will decrease a firm's economic profit, but not change output. If you see lump-sum tax or subsidy, DON'T CHANGE OUTPUT! How does a per-unit tax affect a firm's level of output? A per-unit tax discourages production by raising marginal costs (MC shifts upward). This will decrease the firm's level of output and reduce economic profits. The average total cost and average variable cost curves also shift up, but it's the marginal cost curve that changes the profit-maximizing level of output as the MR=MC point has moved to the left. How does a per-unit subsidy affect a firm's output? A per-unit subsidy encourages more production by lowering marginal costs (MC shifts down). This will increase the firm's level of output and increase economic profits. The average total cost and average variable cost curves also shift down, but it's the marginal cost curve that changes the profit-maximizing level of output as the MR=MC point has moved to the right. Where is the monopolist's socially optimal level of output? 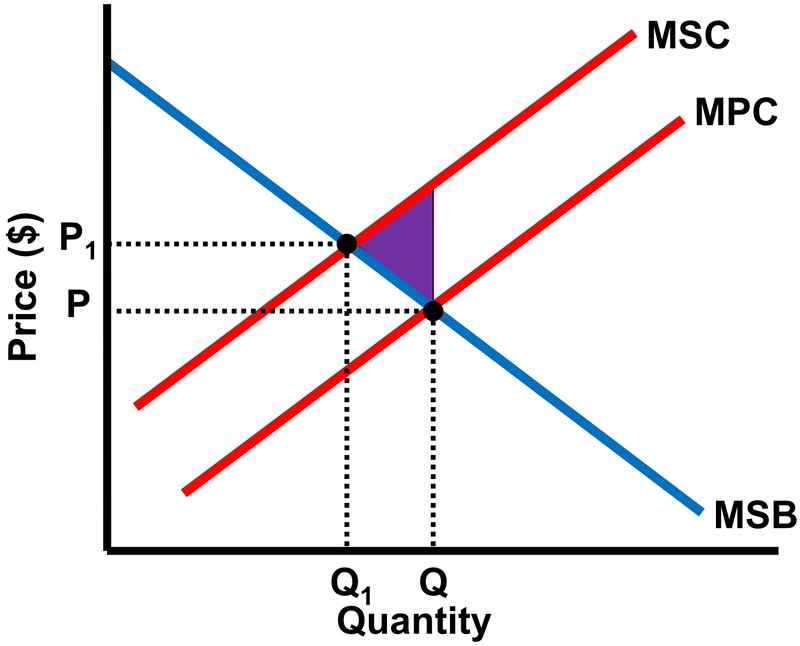 If a monopoly was regulated to produce at the socially optimal level of output, it would produce where the price (AKA demand) intersects the marginal cost curve (P=MC). At this level of output, allocative efficiency is achieved and there is no deadweight loss. This point will maximize the sum of consumer and producer surplus. See the No Bull Review diagram below to see the precise location of the socially optimal level of output. Where is the monopolist's fair-return price? If a monopoly is regulated to break even (AKA earn zero economic profit AKA normal profit), it will produce at a level of output where price (AKA demand) equals the average total cost curve (P=D=ATC). This is known as the fair-return price. Even though there are no economic profits, accounting profits can be positive due to the presence of opportunity costs. Where does a monopoly maximize its total revenue? There is a big difference between maximizing economic profit (Total Revenue - Total Costs) and maximizing total revenue (Price x Quantity). 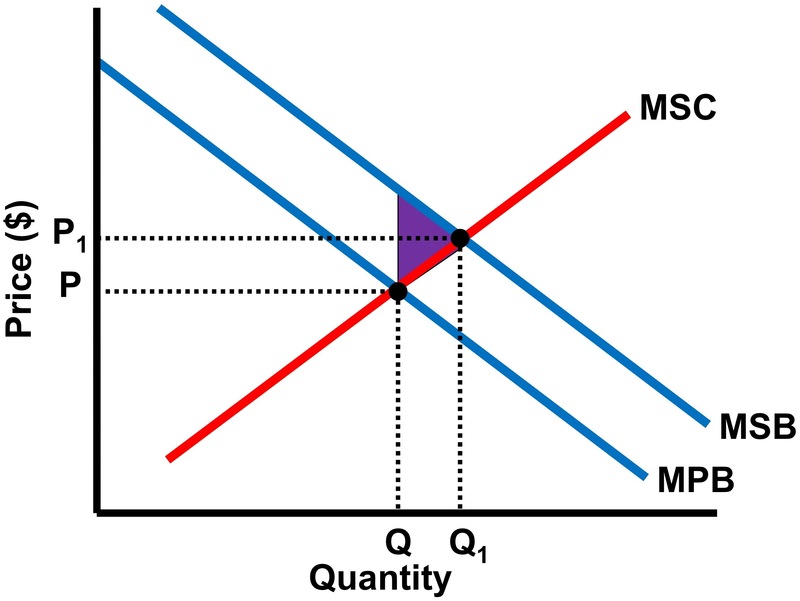 To maximize profit, an unregulated monopolist will produce where the marginal revenue equals the marginal cost (MR=MC) and the price is above that point on the demand curve. The monopolist will maximize total revenue at a level of output where marginal revenue equals 0 and the price is above that point on the demand curve. The elasticity of demand will equal 1 (unit elastic). What are the characteristics of each market structure? There are four types of market structures in microeconomics. 1. Perfect Competition: Hundreds of firms selling identical products; market determines price, firm is "price taker"; very easy to enter; allocative (price = marginal cost) and productive efficiency (price = minimum average total cost) in the long run; breaks even in long run; agriculture is a close example. 2. Monopolistic Competition: Many firms selling differentiated, but similar products; firm has some control over price; relatively easy to enter; breaks even in long run, but experiences excess capacity (average total costs can be lower by increasing output); clothing is a close example. 3. Oligopoly: A few powerful firms selling identical or differentiated products; firm has more control over price; can profit in long run; difficult to enter (significant barriers to entry); firms are interdependent; game theory is often used to show a firm's optimal decision and possible paypout; video game consoles are a close example. 4. Monopoly: One firm selling a unique product; firm is a "price maker"; highly inefficient; high barriers to entry; high long run profits; Utilities are a close example, although they are regulated. Monopolies are inefficient compared to perfectly competitive markets because it charges a higher price and produces less output. The term for inefficiency in economics is deadweight loss. Since the monopolist charges a price greater than its marginal cost, there is no allocative efficiency. Society loses the area between the perfectly competitive output and the monopolist output. This No Bull Review video shows you how to find the area of deadweight loss resulting from a monopolistic market structure. How does a monopoly affect consumer surplus? A monopolist charges a price higher than a competitive market structure and produces fewer units than a competitive market structure. Because of the higher monopoly price, the area of consumer surplus decreases. Part of the original consumer surplus under competitve conditions will be transferred to the producer. The rest becomes part of the deadweight loss. This No Bull Review video shows the area of consumer surplus under a monopoly and how it compares to consumer surplus under a perfectly competitive market. How do you graph a monopoly taking an economic loss? 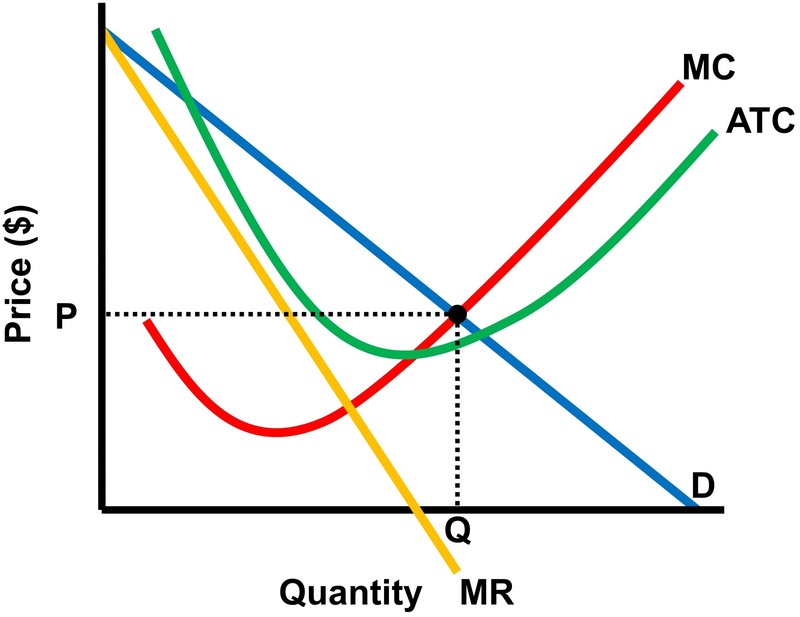 To graph a monopoly taking an economic loss, the price must be less than the average total cost curve at the marginal revenue equals marginal cost level of output. This No Bull Review video explains exactly how to graph a monopoly with short-run losses. How do inflation expectations affect the Phillips curve? Inflation expectations are a determinant of the short-run aggregate supply curve. When the short-run aggregate supply curve shifts one direction, the short-run Phillips curve shifts the opposite direction. If inflation expectations rise, SRAS shifts leftward raising the price level and unemployment (stagflation). 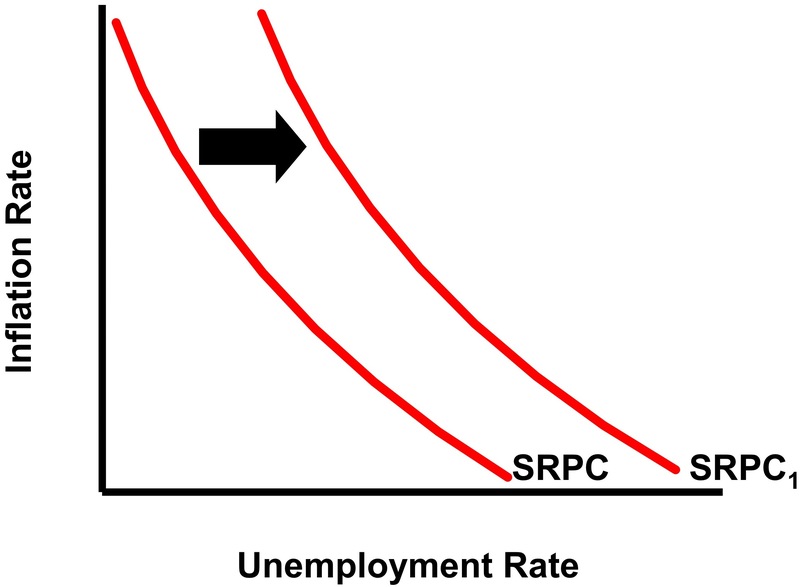 To illustrate an increase in inflation and unemployment with a Phillips curve, shift the short-run Phillips curve to the right (see the No Bull Review diagram below). If inflation expectations fall, SRAS shifts rightward lowering the price level and unemployment. To illustrate a decrease in inflation and unemployment with a Phillips curve, shift the short-run Phillips curve to the left. Inflation expectations do not affect the vertical long-run Phillips curve. How does the economy self-correct from inflation? If an economy is experiencing inflation in the short run, classical economists would say that the government should do nothing and the economy will correct itself in the long run. In the long run, workers will demand higher nominal wages, thus raising inflation expectations and the costs of production. The short-run aggregate supply curve will shift to the left toward the long-run aggregate supply curve until the long-run equilibrium is achieved. The price level increases, real GDP decreases, and unemployment increases. How does the economy self-correct from a recession? If an economy is experiencing a recession in the short run, classical economists would say that the government should do nothing and the economy will correct itself in the long run. In the long run, workers will be forced to take nominal wage cuts, thus lowering inflation expectations and the costs of production. The short-run aggregate supply curve will shift to the right toward the long-run aggregate supply curve until full employment is restored. The price level decreases, real GDP increases, and unemployment decreases.